This week I've been immersing myself in the world of figs. Which means I picked my second fig from one of the two fig plants in my garden (Ficus carica 'Chicago Hardy' and Ficus carica 'Brown Turkey'). The two figs I harvested both came from the Chicago Hardy fig. 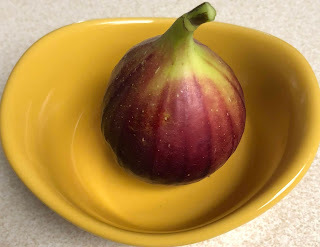 I had, have, so many questions about figs because I've never grown them before and other than eating them in Fig Newton cookies, never really ate them. Oh my goodness. They are so much better fresh than in a cookie! I did read that the figs have to be pollinated by a fig wasp before they will ripen. "Whoa, nelly," I asked myself, "are there fig wasps around here where figs don't normally grow who can pollinate my fruit so it will ripen?" Then I read that these domesticated figs generally do not need a wasp to pollinate them to ripen. Which is good because I was having visions of going out to the fig plants and acting like a wasp by drilling a hole into each fig to make it think it had been pollinated. I also figured out that there is no such thing as a fig flower. Just fig fruit which forms without a flower first and has the flower parts inside of it. Which leads to the old saying, and I paraphrase, "As rare as a fig flower". In other words, if you can find a fig flower, you can probably also find a unicorn! I also read that vegans won't eat figs because those wasps that go into the fruit to pollinate it generally don't make it out of the fig. They don't live long and expend all their energy laying eggs and spreading pollen inside the fig fruit so there is nothing left to leave with. But the fig wasps are so small that by the time the figs ripen, you wouldn't see any bits of wasps left inside. And see above about domesticated figs. After I had sorted out in my mind the whole wasp-pollination deal, I hopefully wondered if the various animals that pass through my garden would know the figs are edible? After all, figs are not native to this area, so how would they know? Turns out they do know. I think. There were little bite marks on the backs of the two figs that have ripened, but I knicked those off with a knife and at the figs anyway. And I saw at least one stem left on one fig plant that appears to have been where a ripe fig once hung, but hangs no more. Drat those critters! To complete my week of obsessing about figs, I also read Gods, Wasps, and Stranglers: The Secret History and Redemptive Future of Fig Trees by Mike Shanahan. It's a fascinating history of figs and explains how plants in the genus Ficus are often the first to return following catastrophic volcanic eruptions and have been used to restore rainforests that were destroyed by over-farming. Anyway, now I want some houseplants in the genus Ficus. And so begins another obsession. Hopefully there are more figs in your future! I have often wondered when figs are ripe and what to do with them so I can eat them. Peal and eat? Stew and eat? I like fig cookies maybe homemade fig cookies. Fresh figs taste wonderful. Much better than fig newtons. No need to do anything with them just eat them fresh. Ficus are great for indoor bonsai. They grow fast and are forgiving of mistakes. The Chinese banyan, Ficus microcarpa, and its varieties make excellent bonsai. It tolerates lower light and lower humidity indoors and does not drop leaves easily. Ficus benjamina can also be used for bonsai. Figs are wonderful to grow and I am glad you are having so much success. Enjoy! We moved to the Algarve in Portugal the very week the figs began ripening, and at least one of the trees, which hadn’t been cut back in years, is about 35 feet tall, literally showering us with figs! We ate them fresh, made sweet and savory jams, and still they kept coming. Next year we will be ready to dry them, too. Our first Sunday morning after church we laughed when we found a bag of figs on our car from a parishioner who was happy to share. My husband says figs here are Portugal’s equivalent to zucchini back home, where abundant crops force gardeners to anonymously leave bags on neighbors’ porches. Next year we’ll be ready! Figs are now a craze here too among gardeners, and i am starting with them now though i still do not have the plants because they are very expensive here. Some got ahead and making money from cuttings and newly growing plants for the addicted newcomers. I am amazed that they are already as old as Jesus but they haven't reached our soils till now! Amusing and amazing!